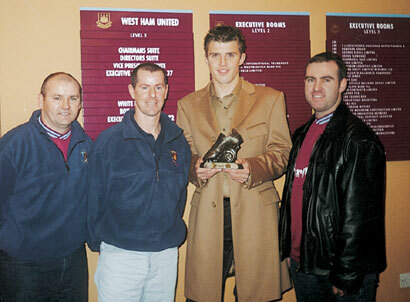 Sebastien Schemmel receives the 'Dublin Hammer of the Year 2002' award from club members during our trip to Upton Park, 21st October 2002. 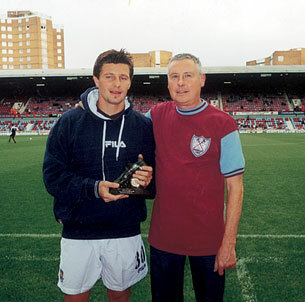 Up until 2006, a vote was taken each year among club members for our dh Hammer of the Year award, the winner of this ballot was then presented with the trophy by club members at the first game we attend in the following season. 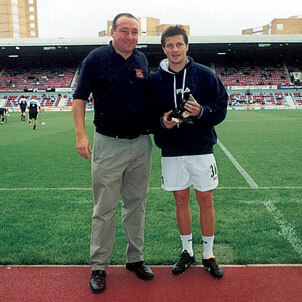 2000 - Paulo DiCanio, 1999 - Shaka Hislop, 1998 - Steve Lomas, 1997 - Julian Dicks, 1996 - Julian Dicks. This practice was discontinued in 2006 after an unsavoury meeting with Teddy Sheringham, who seemed to feel he was much to big to get an award from a supporters club? After that we kind of lost interest in the whole thing... Wanker!